A garda has been injured after being hit by a vehicle which failed to stop at a checkpoint in the south inner city area of the capital. The male officer’s injuries are not life-threatening. The 4×4 fled from the scene and crashed into a wall on Waterloo Road at around 10am. The two occupants of the vehicle then fled on foot and a major manhunt involving the garda helicopter began. Gardai confirmed that a man and woman (20s) have been arrested. They are currently being held at Irishtown garda station. Witnesses said the Volvo XC90 came speeding up Haddington Road with one of the front tyres blown out.“It was making a lot of noise but wasn’t being chased or anything. It was flying,” said one man.The car then turned left onto Baggot Street and then tried to turn right onto Waterloo Road but crashed. 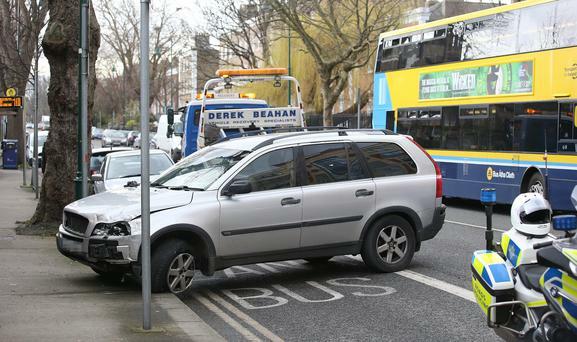 Eyewitness Robert Hoca said the car came from the direction of Baggot Street bridge and crashed into a Dublin City Council vehicle that is used to empty street bins. “They crashed just at the junction with Waterloo Road. There was a woman driving and a man in the passenger seat,” he told Independent.ie. “They got out and were trying to open the back doors of the car, but they couldn’t. Then the man went up the road and he was shouting at the woman to go with him. They didn’t even check to see if anyone who was in the small bin truck was okay,” he added. “At first when we saw them trying to open the back doors we thought there might be kids in the car, because the man and woman seemed very anxious, then in the space of five minutes around 10 garda cars arrived and started searching the area,” said Mr Hoca.